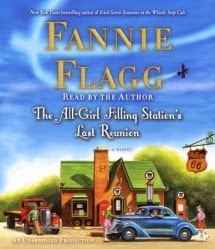 Summary: The one and only Fannie Flagg, beloved author of Fried Green Tomatoes at the Whistle Stop Cafe, Can’t Wait to Get to Heaven, and I Still Dream About You, is at her hilarious and superb best in this new comic mystery novel about two women who are forced to reimagine who they are. I'm pretty sure that I've read every novel that Fannie Flagg has written. It's been some time now since I read FRIED GREEN TOMATOES, and I've always been highly entertained by her characters and heartwarming stories. Needless to say, I was very excited to learn that she has new book out called THE ALL-GIRL FILLING STATION'S LAST REUNION. I was even more excited after I read the description for THE ALL-GIRL FILLING STATION'S LAST REUNION (TAGFSLR). It was described as a "comic mystery" and that certainly appealed to me. Plus the novel appeared to have an interesting plot and maybe even a surprise or two. All of that plus Ms. Flagg's down-home writing style made this book sound like a winner to me. TAGFSLR begins with the story of Sookie Poole, a wife and mother who has just married off her last daughter and is looking for a little R&R with her husband. Her life should be much calmer now... except for her dealings with her overbearing mother. One day, Sookie uncovers a secret about her mother and her past that threatens to turn her world upside down. Sookie begins investing this "mystery" and her research introduces her to Fritzi, a strong and determined woman who not only ran her family's gas station but also served as a pilot during World War II. Sookie's introduction to Fritzi and her family allows Sookie to fill in the gaps about her past. In addition, she gains some inspiration in her own life through the courageous actions of these women. If I'm being entirely honest, I liked TAGFSLR but I didn't love it like I did some other of Ms. Flagg's novels. This is the first book by her that I've listened to, so that might have have contributed to my feelings; however, I just think the book was a little long and even dragged in a few places. Had the book been a few hours shorter, I still think the complete story could have been effectively told; and I wouldn't have been as frustrated with some of the slower parts. Having said that, I still found much of TAGFSLR to be enjoyable. I love Ms. Flagg's zany cast of characters and I did find many things to be very funny in this novel. I even found myself smiling a time or two (or more!) while running on the treadmill. (I'm sure others thought I was very strange.) In addition, I liked how the characters faced some hardships, yet managed to not only survive but thrive! And like many of Ms. Flagg's books, I appreciated the messages about family, friendship, and the strength and resilience of women! The story went back and forth between the present (or almost present day) and the past. Much of the story was Sookie's day-to-day activities, and then it would jump to the 1940s when Fritzi was a young woman. For some of the past scenes, the author used letters which went back and forth between the characters. This might sound strange, but I felt as if the two stories weren't really "related"; and the transitions seemed a little abrupt. I knew that the stories would eventually come together, and I definitely liked how they did at the end of the novel; however, it seemed like a long time before the stories merged. While I enjoyed both Sookie's and Frizi's stories, I have to say that I found Fritzi's to be much more interesting. I don't want to give to much away, but Fritzi's (and her family's) involvement in World War II was fascinating to me. I learned quite a few things about women's role in the war that I had never known; and like Sookie, I gained a huge respect for those women (and men) who served our country in a very tough time. As far as how the "mystery" aspect of TAGFSLR worked, I have to say that it definitely did for me. I liked Sookie's investigation into the mystery, and I admit that I was surprised by what took place. There were a few twists and turns -- one of which actually shocked me, and I appreciated how the mystery eventually was revealed. I have to admit that a few of the ending scenes made this entire novel a worthwhile read (or should I say listen?) for me. I definitely think TAGFSLR would make a fun discussion book for female book clubs. I wasn't able to find an on-line discussion guide; however, I don't think you'd need one. There is a great deal to discuss about family, friendship, loss, war, sacrifice, love, parenting, second chances, forgiveness, acceptance, and redemption. And because so many of the characters evolve so much throughout the course of the story, there is a great deal to analyze about their actions. THE ALL-GIRL FILLING STATION'S LAST REUNION is a funny and heartwarming story about family and courage. It has over four stars on Amazon with over 1200 reviews, so you might want to check it out! I listened to this too and thought it was too long. I think maybe Flagg tried to do too much with the story. I did love her narration, though! I'm on the fence over this. I generally like her books. Kid Konnection: Robot Burp Head Smartypants!